Our son, Peter, is the outdoorsman in our family. He hikes, rock climbs, skis, canoes, and anything else that will get him into the outdoors. When all the rest of us have opted for a motel room, he will choose to sleep outside in a bag on a ground cloth. 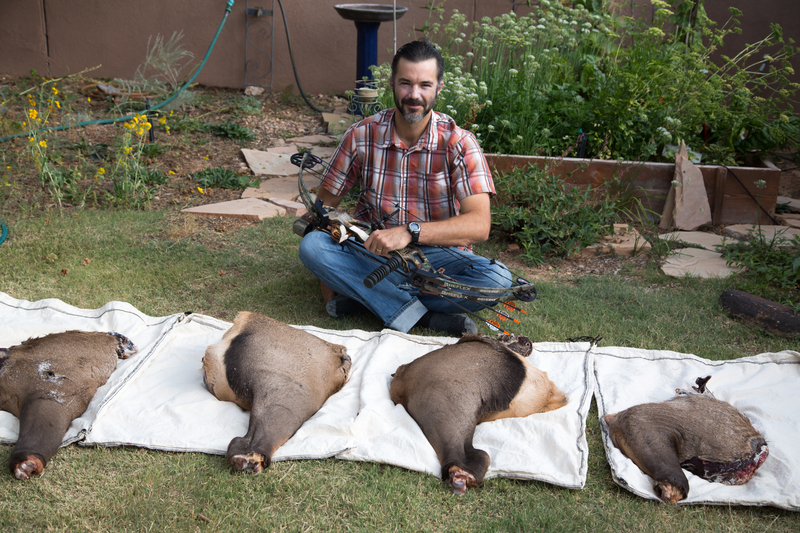 He was excited, then, when he was selected in a lottery to bow hunt for elk in one of the wilderness regions of the Jémez Mountains in New Mexico. He drove to our house in Santa Fe almost non-stop from his home in Northern California, stopping for a few hours’ sleep in the Mojave Desert. We helped him pack food for his expedition, and in a few hours he was off for what turned out to be a five-day adventure. He went to the San Pedro Park Wilderness with much of the trip over dirt roads. 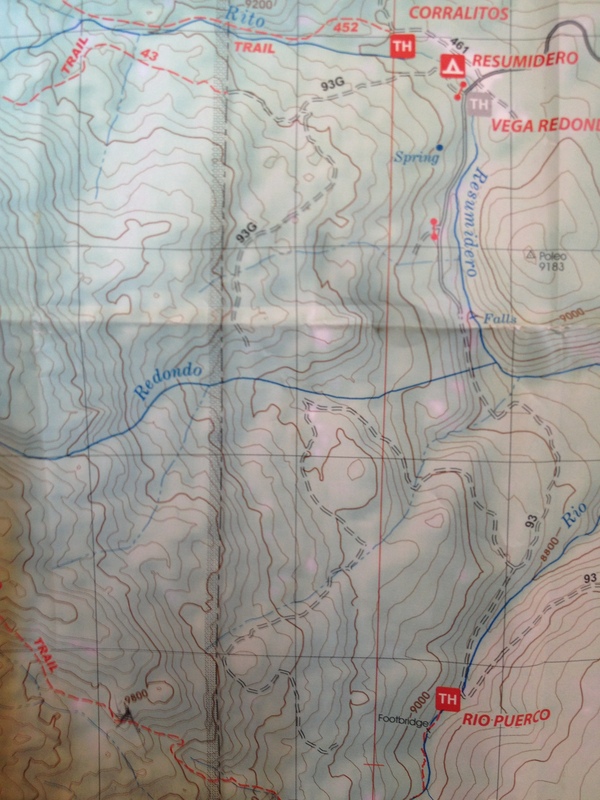 When he got to the trail head, he loaded up his back pack and went for a two-mile hike to his campsite. There were no other hunters, and he had planned the hike so that it would not be too far back to the car in case he bagged an elk and needed to pack out the meat. He wound up hiking another two miles to find a good hunting spot. Hiking can be a strenuous activity, especially with a 50-60 pound pack. It’s fairly easy to use up 400 calories an hour, and even possible to use up 1000 calories an hour, never mind the fluid loss. Thus, it is very important to stay well hydrated and to have a good supply of food. Even if you had pure calorie sources – carbohydrate, protein, and fat – at 4, 4, and 9 calories per gram, respectively, you would need at least a pound of food a day to stay in balance. Of course, these days you can buy elaborate dehydrated meals at the outdoor sporting goods store, but they are very expensive and they also take away some of the fun of planning and packing for a wilderness trip. Using dehydrated or low-weight foods available at the grocery store, we worked up a menu for the expedition. All you need is a good backpacking camp stove and a reliable source of water. Remember to cut instructions off the sides of boxes and drop them in the zippered plastic bag with the food. Put individual dry ingredients in zippered sandwich bags and drop them in the bag of the main dish. Also pack a small squeeze bottle filled with cooking oil and another small container of butter or margarine. Bring small salt and pepper shakers. Gorp, more commonly known as trail mix, is a hiking standby. These days you can buy any number of varieties with a wide range of different nuts, dried fruits, and candies. Some of them are extremely expensive and – in my view – not very good It’s just as easy to make your own, and that way you can include ingredients that you like. Soup made from a packet of dehydrated soup is good while waiting for the main dish to cook. Macaroni and cheese, especially the boxed kind, is an old-time kids’ favorite. It is nothing but dried ingredients. Add a little dry milk powder and some Spam lights, and you have a dish that can be cooked in just a few minutes. At the end of a hard day of hiking it will please everyone, kids and grownups alike. Tuna casserole is another standby. With the new packaging of tuna in foil pouches, this becomes even more light weight. Instant or fast-cooking pasta makes this an easy effort even with just a backpacking stove. Dried fruit – banana chips and apricots make good desserts, along with chocolate bars. If the sunflower seeds are raw, roast them by spreading them out in a jelly roll pan and placing them in the middle of an oven preheated to 300° F (177° C). Bake for 15 minutes, turning them frequently. Remove from the oven and cool before adding to the remaining ingredients. In a large bowl, combine all of the ingredients and mix well. Place in zippered plastic bags. This makes enough gorp for 4 or 5 bags, one for each day of the trip. In a camper’s cooking pot, bring 2 cups of water to the boil. Add the dry macaroni and cook until tender. Pour off all but about ¼ cup of water. Stir in the contents of the cheese packet and the powdered milk. Add butter. Drain and stir in the pieces of Spam lights. Cut them up a bit if you wish. Mix well and serve immediately. Serves one or two hungry hikers. Place all of the dry ingredients in separate packages in a larger plastic bag. In a camper’s cooking pot over a camp stove, bring 2 cups of water to a boil. Add the pasta and mushroom soup. Cook until tender. Stir in the dehydrated mashed potatoes and the tuna, drained. Eat. Should serve one or two . Place all the dry ingredients in separate packages in a large plastic bag. In a camper’s cooking pot over a camp stove, bring water to a boil. Add the instant rice and dehydrated soup and stir until cooked and the water is absorbed. Drain the salmon and stir into the mixture. Eat. Should serve one or two. For breakfast, be sure to bring tea or instant coffee and packets of instant oatmeal. For lunch, if you want to pack the extra weight, dry Italian salami, Parmesan or other hard cheese, small cans of Vienna sausages or Kipper Snacks, along with hard tack or crackers are perfect. Just remember you will have to pack out the cans, and Kipper Snacks can be smelly. Remember, too, if there are bears in the area, the smells will be a magnet. Be sure to secure your food appropriately. The end of this story is that Peter hiked in two miles, set up camp, and then hiked another 2 miles in stocking feet (!!!) to the spot where he got his elk with one arrow at a range of 45 yards. Then he spent a whole day cutting up and packing out the meat in three separate 4 mile (8 mile round trip) hikes to his car. He had a long sleep when he got back to our house. Even though Sarah is trained as a savory cook, by default she has also been doing baked goods and desserts at Rich Table. She doesn’t think of herself as a pastry chef, but her success proves otherwise. Desserts have been among some of the most popular items at Rich Table since it opened over a year ago. There is always pressure to keep some of the old favorites on the menu, but there is also pressure to introduce new items on a fairly constant basis. 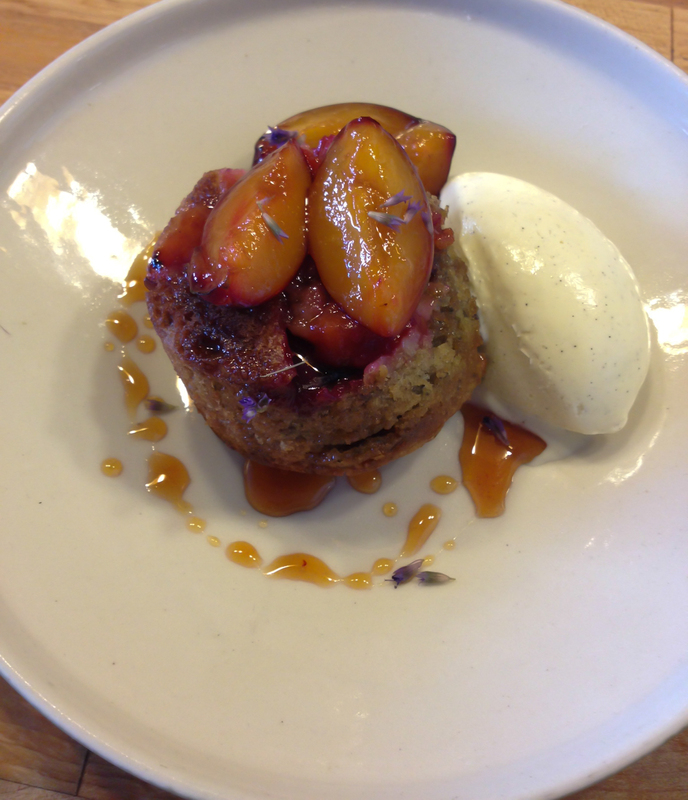 Blue corn cake with honey-griddled plums, and vanilla ice cream. This dessert is a riff on Sarah’s favorite cornbread recipe, but made with blue corn meal. I suspect that comes from her interest in New Mexico traditions. She also has a good source for blue cornmeal from Tierra Vegetables in the farmers market at the San Francisco Ferry Building. 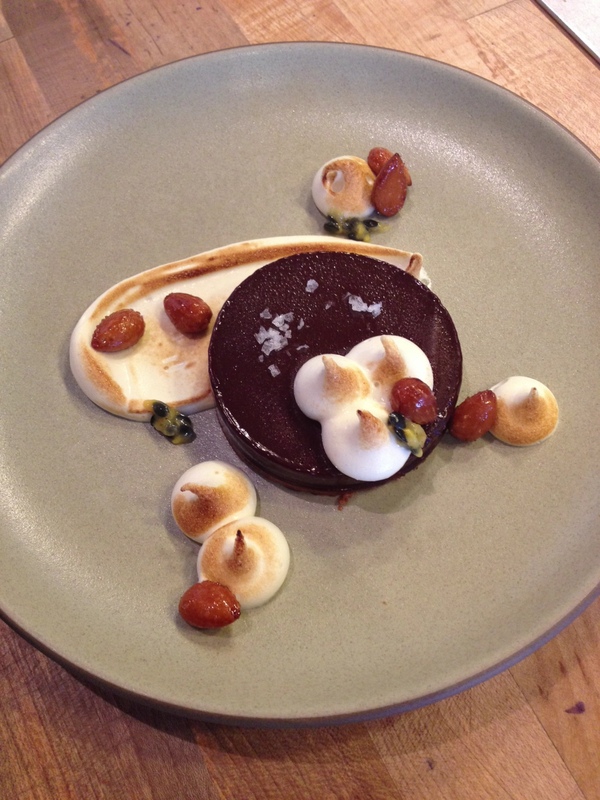 Bittersweet chocolate ganache with almond butter crunch and passion fruit meringue. Panna cotta is one of the old favorites, but Sarah has come up with lots of variations that have kept it popular and fresh. Some of those variations include buttermilk, coconut, and more recently cream cheese. Panna cotta is a cousin of flan, crema catalana, and crème brûlée. Those custards are made with eggs which are cooked gently to provide thickening. Panna cotta has gelatin added for the thickening agent. In commercial kitchens, leaf or sheet gelatin is the form most commonly used, but that form is not often available in grocery stores and is a little trickier to use. That’s ok, because a perfectly good panna cotta can be made with the granulated form, although you may need to experiment and cut back on the amount of the gelatin if the finished panna cotta too firm for your taste. Sarah’s current cream cheese panna cotta is delicious, but if you want to try it at home you will need to tinker with the amount of gelatin you use. The firm texture of the cream cheese sets up too hard with the usual amounts of gelatin. I think her buttermilk panna cotta is every bit as good. Sarah makes it with fresh cultured buttermilk that the restaurant gets when it house-churns its own butter. That’s not practical at home, but fresh commercial buttermilk will work. That’s my version below. Place the water in a small bowl and sprinkle the gelatin over the top. Let stand for 5 minutes or until the gelatin softens. Do not let it stand too long or it will turn into a solid blob that is hard to dissolve. In a medium saucepan, combine the cream, buttermilk, and sugar. Bring to a boil for 5 minutes. Remove from the heat. Using a whisk or immersion blender, stir in the softened gelatin. Stir for at least a minute. Make sure that the gelatin is completely dissolved. Otherwise it will sink to the bottom and form a separate gelled layer. Stir in the orange blossom water and optional Grand Marnier or other orange liqueur. Pour into 6 6-ounce cups. Cover tightly with plastic wrap and chill in the refrigerator for 3 hours or overnight. Serve with fresh berries or your choice of toppings. 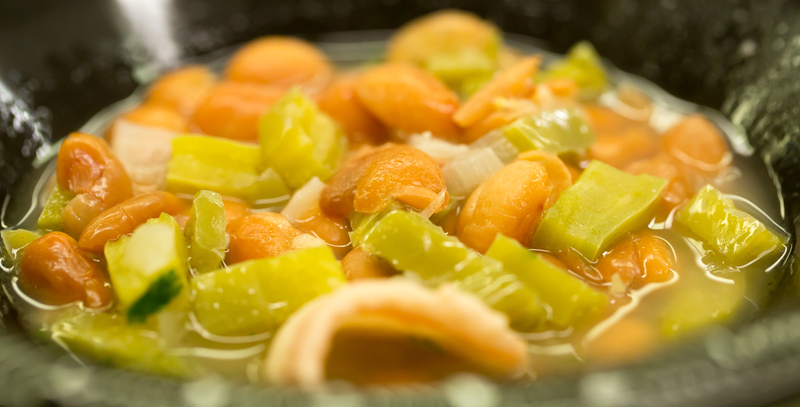 NOPALES – WHO WANTS TO EAT CACTUS? Unless you are from Mexico or the American Southwest, you may have thought that cactus, the big paddles with long razor-sharp stickers were just a sign that you are in the desert. I’m talking about prickly pear with the regional name, nopal (singular), nopales (plural), or nopalitos (diminutive), and the scientific name, Opuntia sp. (There are lots of different species.) If that’s the case, you will be surprised to learn that prickly pear with its various parts is popular not only as food but also as drink. The cactus can be eaten raw, but most recipes call for cooking. Cooked prickly pear is said by many to taste like okra. That may be a good or bad thing. Some people eat large quantities of Opuntia because of supposed healing powers for all sorts of illnesses. There is some evidence that eating cactus can lower the blood sugar, but the effect is not strong enough to serve as a treatment for diabetes. 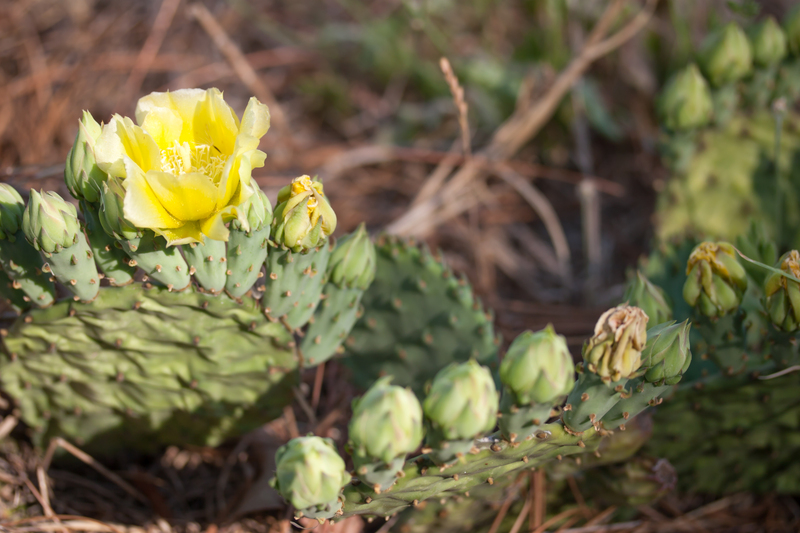 After flowering in mid- to late-summer, prickly pear sets on fruits on the edges of the paddles. These fruits are also called tunas and are so highly prized that night-time harvesters will strip them from plants growing in the median of streets of many towns and cities. Peeled and eaten without chewing (the seeds can easily break a tooth), tunas substitute for candy because of their sweetness. They can be mashed into pulp and juice for drinks, cocktails (cactus margaritas are popular in some Border bars), syrup, or even dessert. The key to success in turning the cactus into something you can eat is to get rid of the spines. Sometimes hungry cattle in dry climates will turn to cactus for food if there is nothing else to eat. The spines can damage bovine intestinal tracts or even blind a cow that gets the spines impaled on a cornea. Those spines can do the same thing to humans. To avoid this, some cooks use a blowtorch to burn off the spines. This approach has the disadvantage of potentially burning the paddles. Others use very sharp knives (along with sturdy gloves to protect hands) to cut off the spines and the thin outer layer of the pad. The easiest way to deal with the problem is to buy prepared nopales in the grocery store. One of my friends, Jim Hastings, has developed an interest in Southwest native foods and foods prepared from native plants. This has led him to develop a number of his own recipes and to conduct cooking classes on preparing an entire meal from cactus. My wife and I recently had the opportunity to attend one of Jim’s classes. For that session his menu included Bean Soup with Nopales, Jicama and Nopalito Salad, Nopales and Green Chile Tart and Cheese Cake with Prickly Pear Dessert Topping. The dessert topping can go on cheesecake, as Jim demonstrated, ice cream, pound cake, or whatever you fancy. In a large pot, soak the beans overnight in the water. Set aside. In another large pot set over medium heat, render the bacon to release the fat but do not crisp. Remove the bacon from the pot. If needed, add oil and butter to the bacon drippings in the cooking pot and heat over medium flame. Add the onions and cook until soft, about 5 minutes. Do not allow to burn. Add the nopales to the beans, stir in chopped cilantro, and adjust the seasoning with salt and pepper. Serve in bowls with salsa or pico de gallo if desired. In a large bowl, combine the nopalitos, jicama, jalapeños, bell pepper, cucumber, chives, mint, and cilantro. Thaw puff pastry according to package instructions. There should be two sheets. In a small frying pan, heat the olive oil until it is barely shimmering. 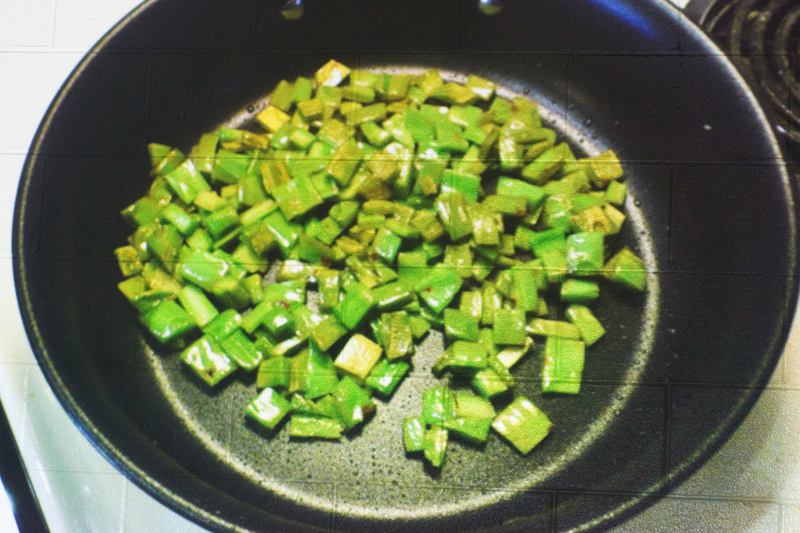 Add the diced nopales and sauté until olive-green and any slime has evaporated. Remove from the heat and cool. Stir together the nopales, green chiles, and garlic. Stir the crumbled oregano into the sour cream Then spread the cream cheese mixture evenly over the dough within the score line. Bake at 400° F (204 ° C) for 10-12 minutes or until the crust puffs and is a golden brown, Remove from the oven and let rest for 15 minutes. Cut into 2 inch squares and serve. Stir together the sour cream and prickly pear jelly until smooth and evenly blended. Drizzle with syrup if desired. As summer nears its end with Labor Day, there is a spectacular bounty at our local farmers’ market. Less so in our neighborhood. We have already run out of recipes for zucchini from our neighbors while our little vegetable garden is limited to herbs and chard. The chard, however, is luxuriant with succulent green leaves and bright red stalks. A few days ago I harvested some of the chard, and then my wife made a recipe out of Deborah Madison’s excellent and encyclopedic Tenth Anniversary Edition of Vegetarian Cooking for Everyone, Broadway Books, New York, 2007. The preparation is easy, and the cilantro provides a novel balance to the flavor of the chard. Of course, summer is the perfect time for fresh corn on the cob as well. That plus a slice of ham makes a real East Texas mid-day dinner. The only thing missing is the dinner bell. My thought about chard is that like many greens, it can be bitter. You can overcome that shortcoming and brighten the flavor with the addition of fresh lemon juice and a little sugar. Whether or not you make these additions, long slow cooking is important, and you should plan to use both the leaves and the stems in any preparation. In a large heavy pot with tight lid, combine all ingredients. Bring to a boil, cover tightly, and cook over low heat for 45 minutes. Correct seasoning with salt and pepper. Serve immediately.